Despite the knocks this figure takes, it is actually quite well done. 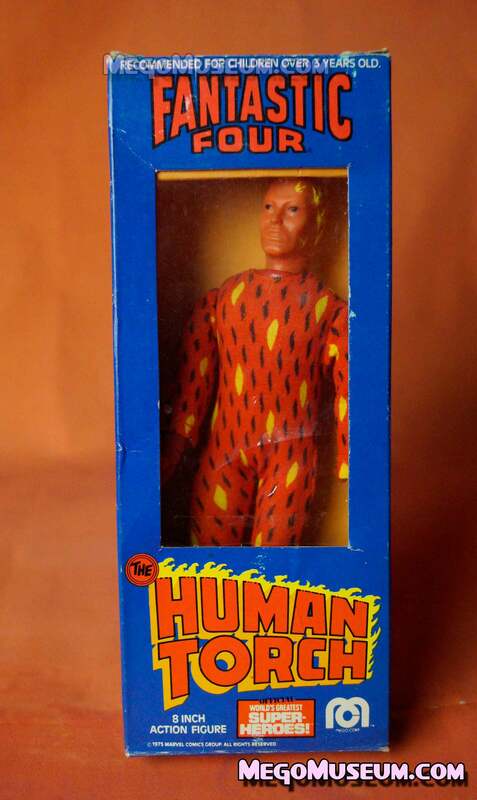 The Head sculpt is a faithful rendition of the character, the body suit a convincing attempt to capture the essence of the comic. 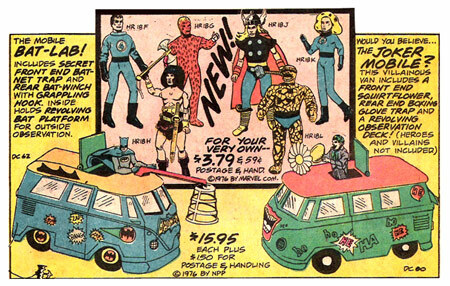 He was released on 1975 and 1979 US cards as well as window boxes, but like all Fantastic Four figures is most commonly found on 1979 Pin Pin French cards which were widely distributed at a discount in the early 1980s. Sadly, it is these figures that suffer from vinyl migration in the heads, AKA zombie disease and Human Torch bodies of that variety tend to be very fragile at the knees. 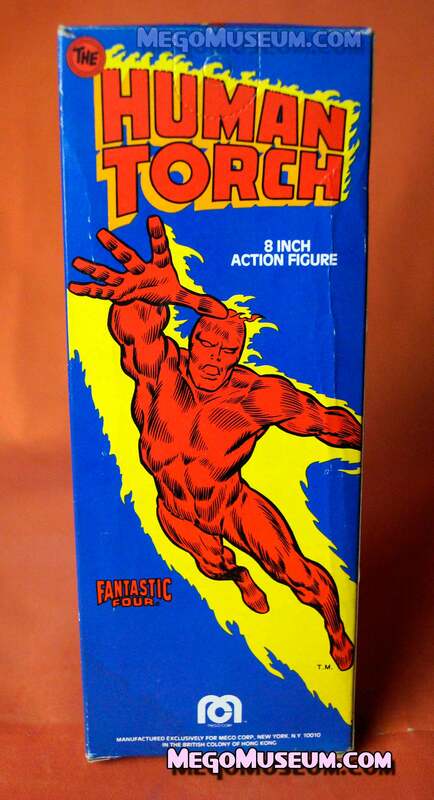 Mego Human Torch was released in 1976.The Human Torch was introduced in 1976 as part of the last wave of new 8″ WGSH characters that included the Mighty Thor and Conan. 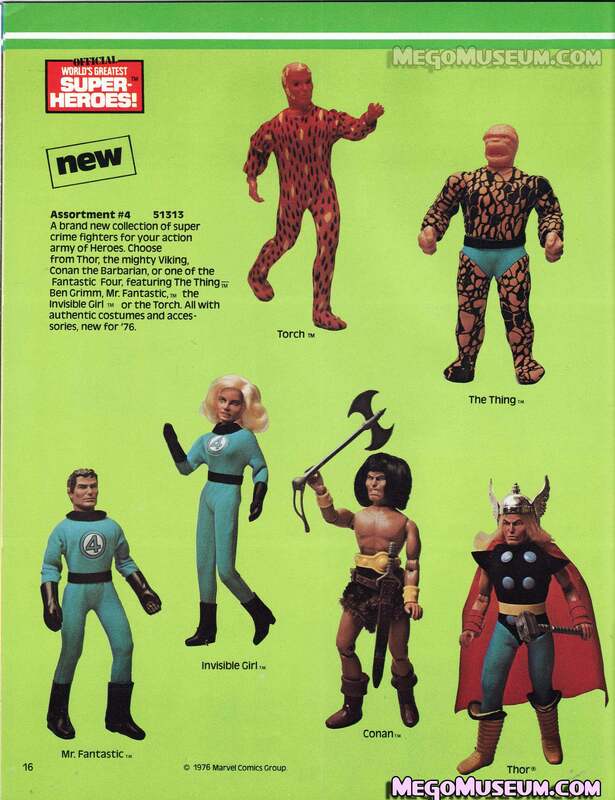 These would be the last new 8″ WGSH based on Marvel characters that would be introduced by Mego. 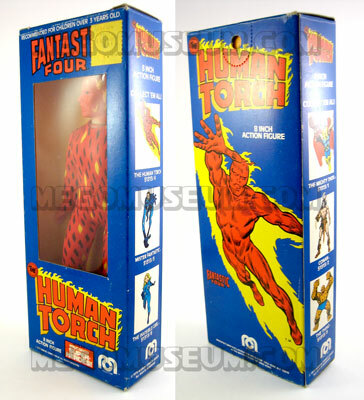 The Human Torch was released in a window box in 1976, the only variation to the box is the insert colour, which vacillates from blue or orange. Harbert, Mego’s then distributor in Italy also added an Italian language sticker to the boxes and this can be found on the secondary market. 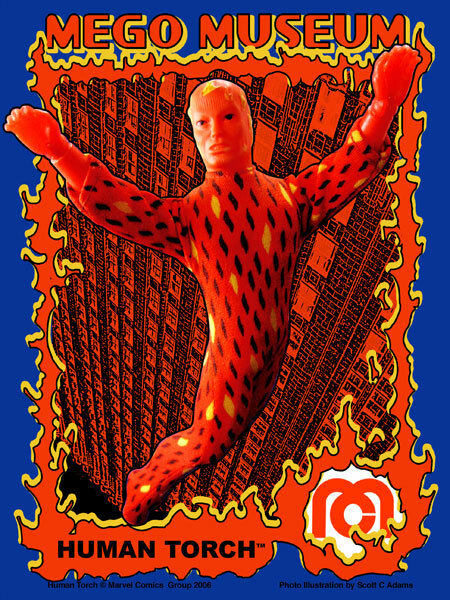 Mego Human Torch on his 1975 US card and a 1979 Pin Pin card (France) where he is La Torche Humane. 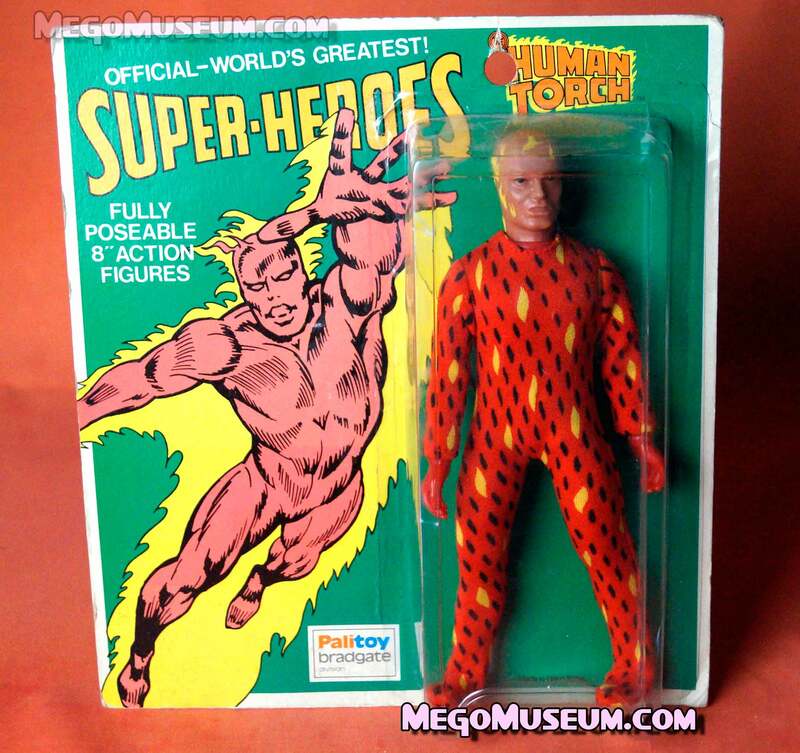 In the early 1980s, Mego liquidated Superhero product meant for the French market into the United States. These toys are often mistaken for being “Canadian” but are actually from France. 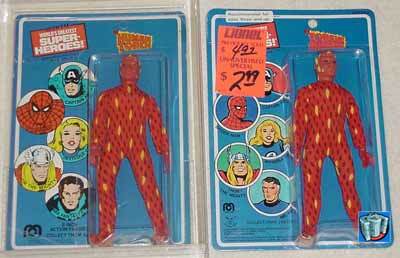 It is common to find the Pin Pin carded figures with large red clearance stickers like the ones above. 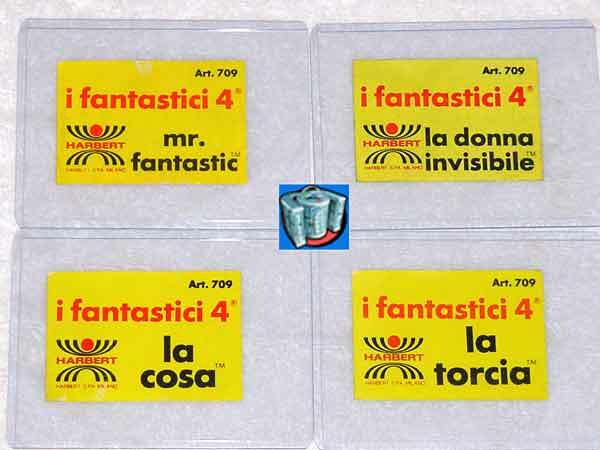 In Italy, Harbert just placed an Italian language sticker over the US Mego cards and boxes until they eventually produced their own line of cards. Below is a nice set of those stickers on their own, cards and stickers are courtesy of Dan.